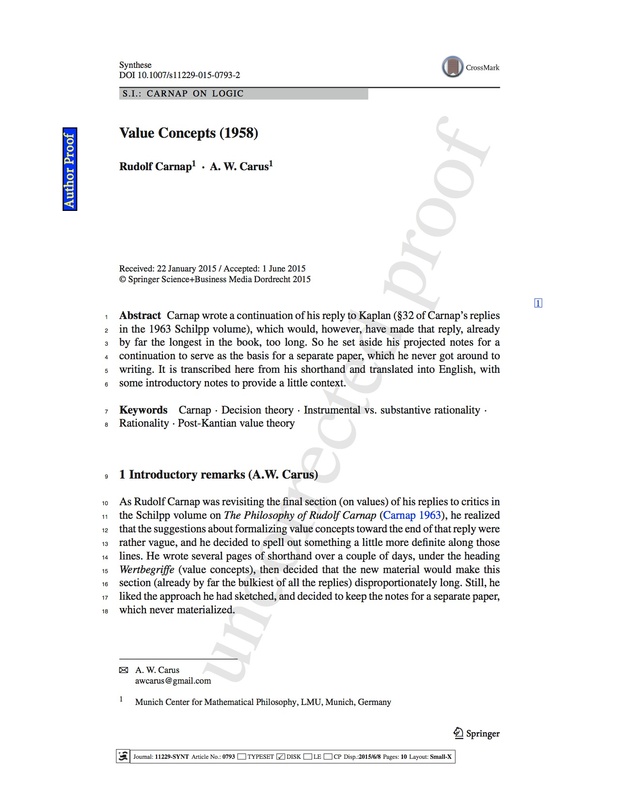 Here are the proofs I was sent of Carnap’s “Value Concepts” fragment of 1958; have a look at Carnap’s institutional affiliation. Quite a coup for Hannes Leitgeb to be able to attract such people, even from beyond the Styx! Also of course it’s rather nice to be listed as Carnap’s co-author but unfortunately I’m going to have to correct that. This will be its only appearance. Apologies for the absence of posts over the past few weeks, and thanks to those who keep coming back to see what’s up. I will get back on track now, and may even have a few comments on the CLMPS in Helsinki next week, where I’m giving one of those mini-papers, but mostly interested in what others have to say.